If you have been following my blog, you might have noticed that I switched to a domain. FYI, I did the switch because I decided to take this blog a little more seriously. So for the past few months, I've been focusing and planning on how to improve my blog contents, how can I serve and connect with you readers better etc. ; as I'm committed to provide good contents to my readers, as well as to encourage and help the people who are facing acne problems. At the moment, I'm trying my best to post articles (with informative contents) as often as I can; I hope what I have shared can be helpful to you readers. Anyway, it may take some time for what I have planned (the changes) to be implemented on my blog — stay tuned! By the way, I am very open to suggestions/ideas/requests! Write to me at bitsdiaries@live.com, ask.fm/bitsdiaries or you can also send me a message through LINE — here's my LINE ID: BITSDIARIES. Let me know what you think and I will take them into consideration. 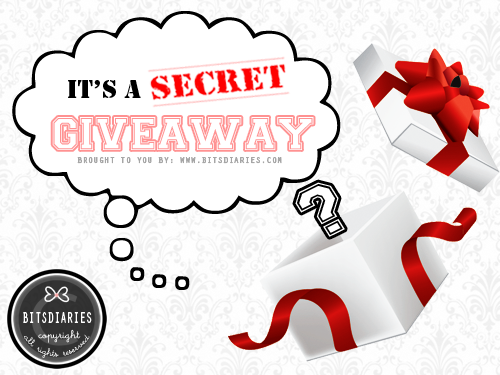 ... Let's move on to the main highlight of this post: SECRET GIVEAWAY! It is basically a bag contains a mixture of skincare and makeup goodies from various brands (mostly from Korea); they are mostly sample sachets/kits, but if you are lucky, you might get some travel-kit items. Each bag will be packed randomly by me. This giveaway is OPEN INTERNATIONALLY and there will be TWO WINNERS. Easy lah! You just need to SHARE IT! - SHARE this giveaway in your BLOG, FACEBOOK, INSTAGRAM, BLOGLOVIN', TWITTER and/or any other SNS platforms. Note: The giveaway entry period starts on 24th September 2015 and ends on 8th October 2015, SGT 11:00 PM. - BITSDIARIES will not be responsible or liable for any loss or damage of the prizes. Omg, I so hope I win! Also, fun fact, I'm coming to Singapore day after tomorrow! Innisfree better stock up because I will buy all the things (okay so not all the things because I ain't ballin)!